The building was designed by architect Såd Benkirane and accommodates 60,000 m2 of offices. CCL was consulted at an early stage to provide an alternative post-tensioned solution for the structural consultants PYRAMIDE. The solution accommodated the requirements and improved the design in terms of cost, by both removing the proposed drop beams and introducing a thinner slab. The use of the CCL value engineering service at an early stage meant the project could be changed to a post-tensioned alternative without causing any delays or complications to the construction schedule. 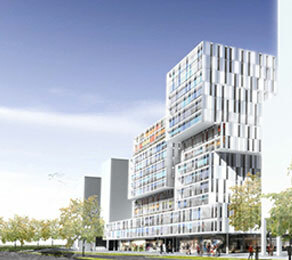 CCL was selected by CDG Development (Caisse de dépôt et de gestion) to undertake the execution because of its ability to meet the tight deadlines on the project. CCL provided local support to achieve the benefits detailed in the design. The integrated package of design, supply and installation through CCL’s local companies, provided the client with a quality solution from concept to completion.